Permanent pastures of clover and rye grass will remain the foundation of New Zealand’s intensive pastoral farming with clover providing the bulk of the nitrogen required for high production. Over the last twenty years increasing quantities of nitrogen fertiliser has been applied to New Zealand pastures and many farms have developed a dependence on regular applications to maintain growth. A reliance on fertiliser nitrogen for high pasture yield is no longer acceptable. The cost of nitrogen fertiliser will steadily rise and its use increasingly regulated. The maintenance of our clean fresh water is now essential for the production of premium quality food for international markets. CalciZest applied in spring stimulates clover growth over summer when soil temperatures encourage the seeding of grasses. Clovers thrive with increased direct sunlight and higher temperatures. In the 2006 spring, 6 properties applying CalciZest and/or DoloZest had the following percentage of clover in the sward compared to 6 traditionally fertilised properties. Well managed pastures using CalciZest as part of a sound nutrient programme are able to grow more than 20 tonne of DM annually without reliance on fertiliser nitrogen. Early in November rye grass, usually the dominant grass in pastures, changes from strong vegetative growth to developing a seed head. From the table above it can be seen that the clover content in well managed pastures steadily increases throughout spring and early summer, providing a range of benefits. Clover contains significantly higher levels of calcium than grass. Whether the focus is milk production, or the growth of animal frame and meat production, calcium provides the base. Clover is also more digestible than grasses, which means that animals can eat more, grow more rapidly, and produce more milk solids. Monitoring work on properties where CalciZest is applied shows that clovers nearly always contain more and never less soluble sugars i.e. the energy content is higher than grasses. 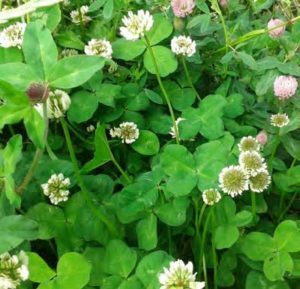 The physical structure of clover allows for efficient utilisation of sunlight with a strong clover sward able to protect the soil during hot weather reducing loss of moisture. Well structured pastoral soils in New Zealand normally contain between 5,000 and 14,000kg/ha of organically held nitrogen in the top 25cm. Nitrogen uptake by pasture plants is usually around 450kg/ha annually. Visual Soil Assessment work by Graham Shepherd indicated that properties using CalciZest based programmes have low potential for greenhouse gas emissions and are sequestering carbon. The nitrogen fixed by clover is provided as required for growth, with surplus held in the organic matter of the soil and available for plant uptake at a later time. It’s a highly efficient and effective natural system. CalciZest, as the basis of total nutrient programmes, supplies the extra plant available calcium required for long stemmed, large leafed clover while providing the environment for increased numbers of beneficial earthworms. Since the start of measuring and monitoring work in 2003 it is noticeable that there is little, if any, flea or weevil damage to CalciZest-fed clovers. Healthy plants with sufficient of all nutrients necessary for optimum growth are largely unaffected by pest or disease. Bloat is not necessarily a consequence of clover. When clover growth is calcium rather than potassium driven, at the ideal time for grazing, the stem of the clover will be solid and the likelihood of bloat is minimised. Clovers in pastures growing under near ideal conditions can fix in excess of 240 kg of nitrogen per ha per year. The balance of the N required comes from soil microbes able to fix N directly from the atmosphere, urine, and the breakdown of dung, plant roots and uneaten herbage, provided the soil is well-structured and strongly biologically active. The process of making CalciZest involves the culturing of selected fungi and bacteria onto biocarbon. Sufficient food is added to ensure rapid colonisation of the soil after application. Even when the soil becomes dry soon after application, beneficial biological activity is obtained when rain arrives. Application rate. Typically 400kg/ha provides outstanding performance. CalciZest is recommended as part of a comprehensive nutrient input programme. As CalciZest is a natural product, it is not possible to guarantee analysis to be absolute. Each mix produced will be such that there will be no significant difference in results obtained. A unique Soil Improver containing biologically active Dolomite. 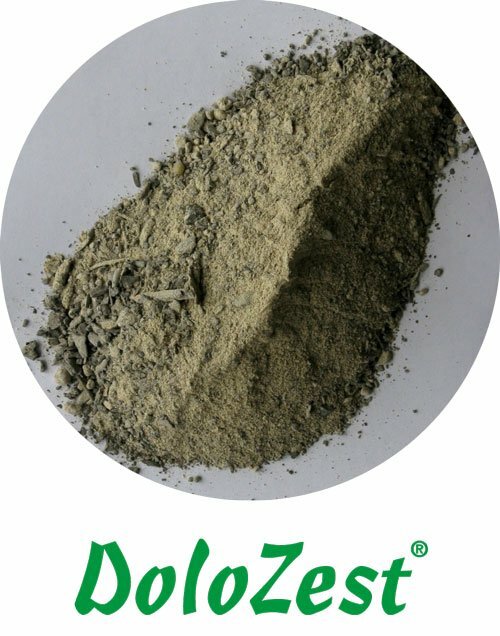 DoloZest was the first product developed by Functional Fertiliser and remains the foundation on which most total nutrient programmes are based. The requirement for annual inputs of magnesium on nearly all dairy farms has been well understood, and it was our experience with Golden Bay Dolomite over more than a decade that led to the development of DoloZest. Dolomite from Golden Bay, New Zealand’s only dolomite deposit, contains 11.5% magnesium and 24% calcium in the carbonate form. It’s an outstanding soil conditioner in its own right, reducing the negative effect of excessive treading pressure. However, it’s the addition of our unique Zest component that makes the product an essential input for an increasing number of dairy farms throughout the country. 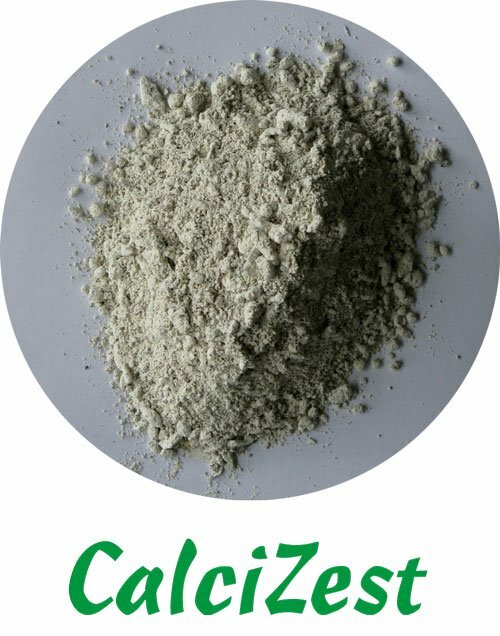 Zest when added to dolomite makes it not only an extremely effective and fast acting magnesium fertiliser, it also kick-starts the process of humus building. The formation of humus begins with the sequestration of organic matter, i.e. dung, old root and dead grasses, and when fully digested by soil biology humus is formed. Humus as we understand it is highly stable and able to withstand extreme treading pressure as well as the effect of severe drought and flooding. Increasing the carbon content of soil is the basis of any pastoral farming system, and it’s the speed at which this takes place that dictates the rate at which production can be sustainably increased. Without carbon being sequestered and humus developed pasture production becomes spikier, with the time between the spikes in growth and the troughs of slow growth coming closer together. When the conditions necessary for strong pasture growth coincide:- nutrient availability + sunshine + favourable temperatures, pasture growth can exceed 90kgDM/ha/day, and where soil carbon is being constantly sequestered these high levels of growth can be maintained over a number of months. Soil carbon, often referred to as soil organic matter (SOM), provides the storage for nutrients including nitrogen and moisture. Greater storage capacity means strong growth is maintained for longer, and the periods of slow growth lessen. Carbon is also a highly effective filter and with reduced soil carbon the ability to retain nutrients, particularly nitrogen steadily declines. Nitrogen lost to groundwater is no longer available for plant growth, pasture growth slows and ultimately water requires costly treatment. 80% of a lithium ion battery is pure carbon, it’s the element that the modern world is dependent on, and pastoral farmers have the ability to sequester it as part of their farming practice. It’s only a matter of time before a dollar value is attached to carbon and properties where carbon is being sequestered will have greater value and command a higher price. Are all farms sequestering carbon? Unfortunately the answer is no. The majority of intensive dairy farms are losing carbon and have been for over thirty years, on average at a rate of 1.0 tonne/ha/year, which means one third of soil carbon on many farms has gone. The results of that loss are already obvious. Although milk production per hectare has steadily increased over the same period, annual pasture production has steadily declined, with grazing off and bought in supplement filling the gap. Summer growth has declined with ‘droughts’ now the norm even though rainfall figures have changed little over the same period. ‘Permanent’ pastures now require renovation or renewal every 4 – 5 years. Animal ill-health costs have steadily escalated and regular veterinary intervention is now necessary even though dairy cows are one of the most robust animals alive. Empty rates are often in excess of 20% which means little if any room for discretionary culling. In our view the loss of soil carbon can be attributed to excess nitrogen fertiliser use. The use of DoloZest based total nutrient programmes containing phosphorus, potassium, and sulphur as required are not dependent on nitrogen fertiliser for exceptional growth. On-going monitoring of properties using these programmes show growth to often be 20% higher than conventionally fertilised neighbouring farms, with annual production as high as 20 tonne/ha recorded. It’s the unique suite of specifically selected beneficial fungi and bacteria that are largely responsible for the outstanding lift in performance. Mycorrhizal fungi are highly efficient gatherers of phosphorus and moisture and form a symbiotic relationship with plant roots, with some of the extra energy plants are able to manufacture being returned to the fungi for further harvesting. 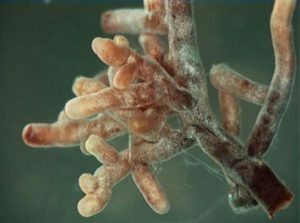 Mycorrhizal fungi are also able to extend the root zone of plants several times over and extract both nutrient and moisture plant roots are unable to reach. Trichoderma are used to increase overall biological activity in the soil and are well-known pathogen suppressants allowing beneficial organisms to dominate. A range of bacteria primarily involved with rapid breakdown of semi-digested organic matter are also included. These increase the speed at which the rapid organic cycle operates allowing soils to operate more efficiently reducing the requirement for large amounts of added nutrient. Higher farm income with lower costs. Sheep & Beef: 150 – 175 kg/ha annually or 300 – 350 kg/ha every second year. As DoloZest is a natural product, it is not possible to guarantee analysis to be absolute. Each mix produced will be such that there will be no significant difference in results obtained.